RIM CEO Thorsten Heins is on the hot seat, and as the days get closer and closer to the January 30th 2013 introduction of BlackBerry 10, his job has changed. From exhorting his teams inside RIM to get things done on time, Heins' job now is to be the evangelistic leader who spreads the word to the media, trying to make believers of those who have been let down by the Canadian manufacturer dating back to the half-baked software on the BlackBerry Storm 9530. The BlackBerry Storm fiasco occurred under a fairly weak leadership that suffered from a lack of vision and couldn't embrace the touchscreen era that was thrust upon them by the launch of the OG Apple iPhone. 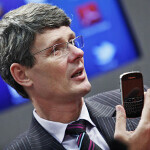 But Heins believes that the role is now reversed and that the upcoming BlackBerry 10 is ahead of iOS. He calls iOS a downsized PC operating system compared to BlackBerry 10 which Heins describes as a "true mobile computing platform". The RIM executive says that carriers are glad to see RIM being competitive again. He adds that you can't be a global leader in the industry without being strong in North America. Heins believes that BlackBerry will get support from U.S. carriers who are looking to offer more than just two strong platforms. He notes that Android is dominated by Samsung and sees the Korean company becoming the strongest player in the Windows Phone 8 market. Heins adds that other manufacturers can't compete with Samsung because of the latter's ability to source in-house, and even purchase displays from "corporate siblings". Carrier support will be one of the things Heins will be counting on to make BlackBerry 10 a success in the U.S. and Canada. Earlier this year, Heins was criticized for aiming low with his comment that "we have a clear shot at being number three," behind iOS and Android. But Heins said that he had to be truthful. "Make no mistake, my aspiration is to win,” he said Thursday. "But I can’t sit here in front of investors and partners and say we will be number one." For those who have followed RIM for years, this is a refreshing change from the often outlandish statements made by the old regime, which had a problem with denial. Where Heins has done his job is with getting everyone interested in seeing what BlackBerry10 is all about. There is anticipation for a BlackBerry device for the first time since the failed BlackBerry Storm launch. And for the first time in years, there is the sense that RIM is actually listening to the marketplace. Consider the specs for an device rumored to be RIM's first high-end BlackBerry 10 model, called the BlackBerry Aristo. Rumored to have a 4.65 inch screen with 720 x 1280 resolution, a quad-core 1.5GHz Qualcomm Snapdragon S4 Pro APQ8064, LTE connectivity, and 2GB of RAM, these are undeniably high-end specs that would match-up nicely with the current high-tech models now in the market. Looking forward to seeing what RIM has come up with in terms of hardware/software integration. Hopefully they will have made those extra months count for something! Agreed! It's good to have alternate players! That said, ios isn't a downsized platform, it's a media player platform with a bunch of apps. It may be based on desktop code but it is closer to a graphing calculator than it is to a desktop. For the sake of diversity & excitement in the mobile sphere, I hope RIM can pull this off. envy? LOL I want RIM to be successful, but they must show what they have achieved and not talk like BB10 is the only real deal in technology. By the way I'm not a fan of iOS, but I find Heins sounds awfully like Ballmer. RIM has spent years of funding and researching on the BB10 OS. Talk is cheap is right- you should make an OS by yourself and some other geeks. Spending lots of money does not guarantee success. 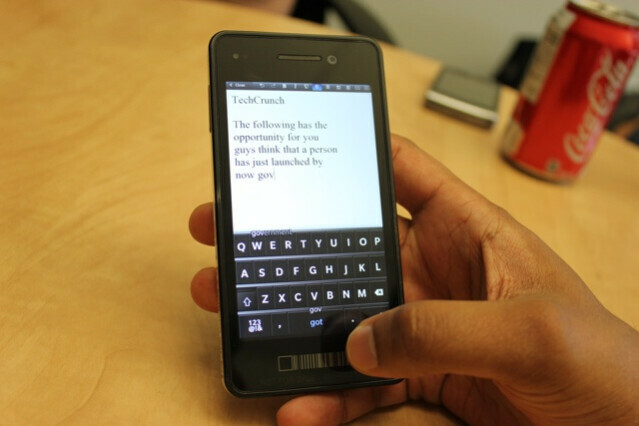 BB10 needs a big idea and not merely copy Android or iOS. I'm eager to find out what RIM has done. I feel like RIM is only talking big but not doing anything. They keep bashing out iOS and Android. I am by no means defending iOS but hey at least the company is making billions and Android is moving ahead faster than anyone. But where is RIM??? They basically have no market share. Even if they come out with some crazy feature id think every ios and Android user wil convert to blackberry. They are just too late!! Open source? LOL. If you believe that, you're as much a drone to the lies of g00gle as the i-sheep that think the latest i-phone is innovative. Try mer, or nemo or Jolla if you want REAL open source. You know that before BB10 is revealed? It's a new platform how could it have the same amount of apps as ios or android? You can port/use Android apps on a new platform with ACL like its possible on Sailfish and PlayBook. BB10 is supposed to have access to Android apps, hence giving it as many or more apps than ios. RIM should stop making false claims and release bb10 fast. They are gonna be dead anyway. Well I shall be rooting for them and hope they survive. Competition is always good and without it there's stagnation. i know right!! thats exactly the point! without competition, there's stagnation! so hope people will stop hating RIM and BlackBerry! they are just giving more and more for us to choose! Here's a link to a 14 minute live demo of some of the new features of the BlackBerry 10: youtube.com/watch?v=tzxQ2YUjk50 Feel free to weigh-in by giving a thumbs up "or" down whether or not you're liking what you see so far. Just watched it... nice. Like the lock screen, like how you put the phone to sleep, like the notification features. I want that alarm clock on Android yesterday. Real easy to set alarms with that. I might need to read up on BB 10 some more.... I like Android...but I am a Motorola fan because so far their phones work the best as phones. I always heard good things about BB and reception. I could leave Android for BB if I get better reception. Maybe. Android apps being available on BB might help sway me. The UI seemed nice and smooth too. So now I am rooting for WP and BB....lol. Whatever, all companies should bring products to consumers a day or two after the announcement. Period. no need to rush!! and remember RIM dont have that much money! and even Microsoft's WP8 wasnt that rush (rush to be seen in the public but not rush in the market) and besides they need to make their "ECOSYSTEM" big, coz that what matters now in this world... a sad truth! so they need devs and apps for their BB10! but this isnt a pain for devs... all they need to do in their apps to work onBB10 is just copy and paste! no rewriting needed! only some few tweaks and then its done!